VisIt requires matching versions on the client (your computer) and the server (Comet). For example: VisIt 2.9.x matches with VisIt2.9.0 and VisIt 2.9.1, etc. Login to Comet and use the list command to identify installed versions of VisIt. As of this tutorial, the default version of VisIt on Comet is 2.9.1. Make sure that your computer has one of the matching versions of VisIt installed on Comet, if not then download and install a compatible version from the VisIt website. 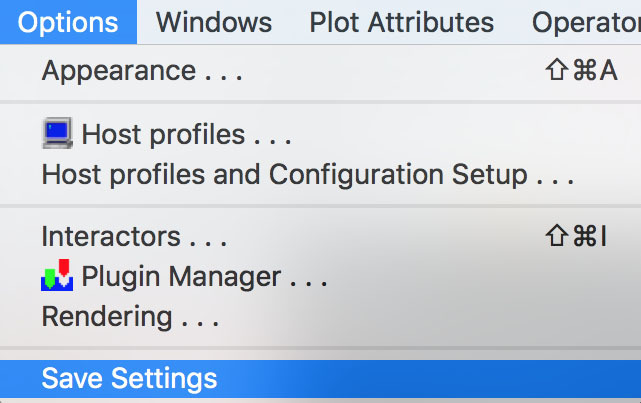 Change the tab to Launch Profiles in the upper right of the window. 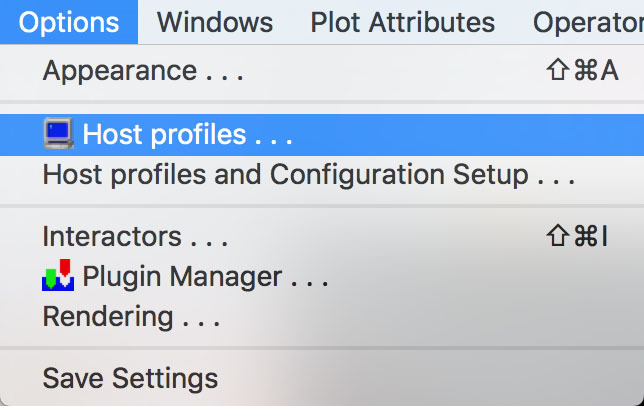 Create a profile by clicking New in the middle of the window. Click Apply on the lower left of the window and then click Dismiss. Caution: Your settings are not yet saved so the next step is very important and easily missed by many users. From the Options menu, choose Save Settings. If you miss this step, your host profile will not be saved! Connect to Comet from the VisIt client on your computer. Start the VisIt application on your computer. In the VisIt main window under Sources click the Open button. Note: In VisIt Open performs a function to connect to a remote resource as well. Select the drop down list of hosts at the top. 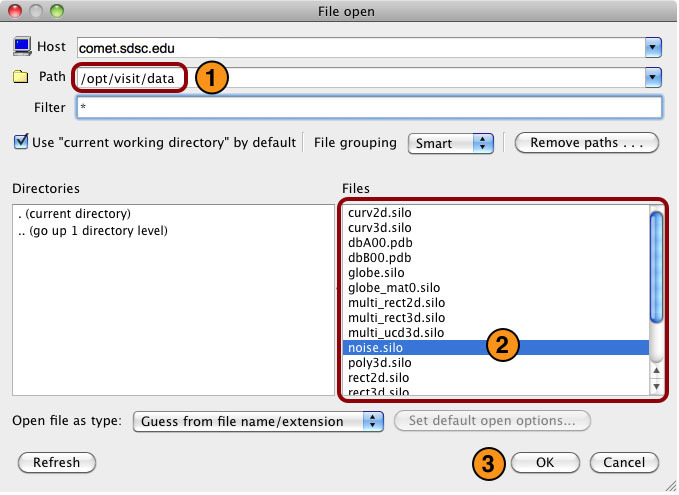 In the Host field, use drop down button on right and choose SDSC Comet. You may get a prompt to allow VisIt to connect to Comet. If you are asked for your password, enter it and click OK. Once connected to Comet you should be able to see a listing of your home folder on Comet similar to the following figure. Now you can browse and open the desired files for your visualization. First, be sure you are connected to Comet as described above. Change Path to /opt/visit/data . Hit Enter Key to load content in the above folder. In the right file list panel choose noise.silo . Click OK button on bottom right. Click Draw in the Plots section. You will get another window showing that the job has been submitted and it is waiting for the job to run and start. If the machine has nodes available your job should start in a short time. If your job does not run then login in to Comet using ssh and check the wait time for your job. Once the job runs you should see an image as shown below. Now you are all set to start visualizing your data using VisIt on Comet. The VisIt application relies on complex integration with job scheduler and several dependent libraries making these instructions not easily transferable to other XSEDE resources. This section provides a simple way to run VisIt in batch mode on Comet. The script currently requests 2 nodes with 16 cores for 5 minutes. This may need to be increased for more computationally intensive visualization tasks. Change your allocation account in the line #PBS -A gue998. If you are unsure of which accounts you are authorized to use, run the show_accounts command. Once the job completes, you should see myBatchRender0000.png and myBatch_render* log files in your batch_visit directory. Often it is necessary to identify best node to core ratio for visualizing large data. This section provides instruction to determine best performing configuration for rendering with VisIt on Comet. Change your allocation account in line 13: myAccount=PROJECT. If you are unsure of which accounts you are authorized to use, run the show_accounts command. The number of nodes in line 7 may need to be increased for very large visualization problems. 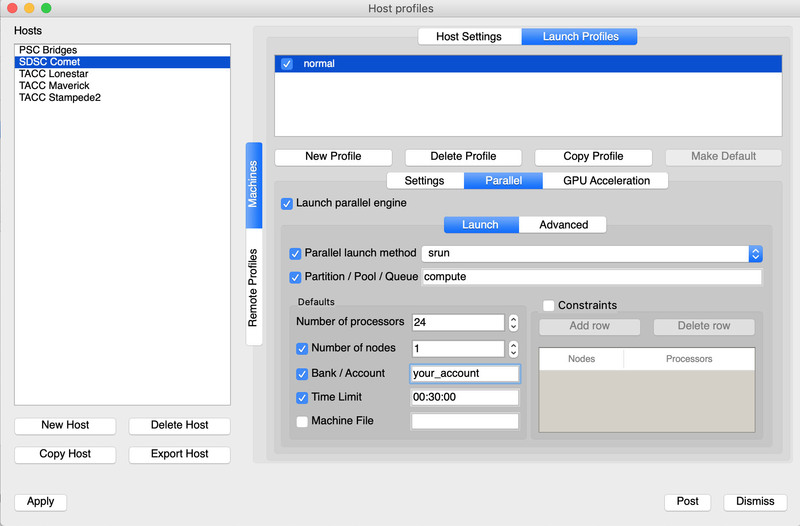 Change permissions and execute the launch_bench.sh script. Finally, the myBench_setup script is automatically submitted for different configurations in a way such that only one job runs at a time to avoid data file read contention. Once the job completes you should see several images named myBenchRender*.png and myBench_nodes*cores* log files in the bench_visit directory. While the test case chosen here is trivial, this method could be very useful with large data sets. Make sure that the VisIt application version on your computer is compatible with a VisIt version available on Comet. 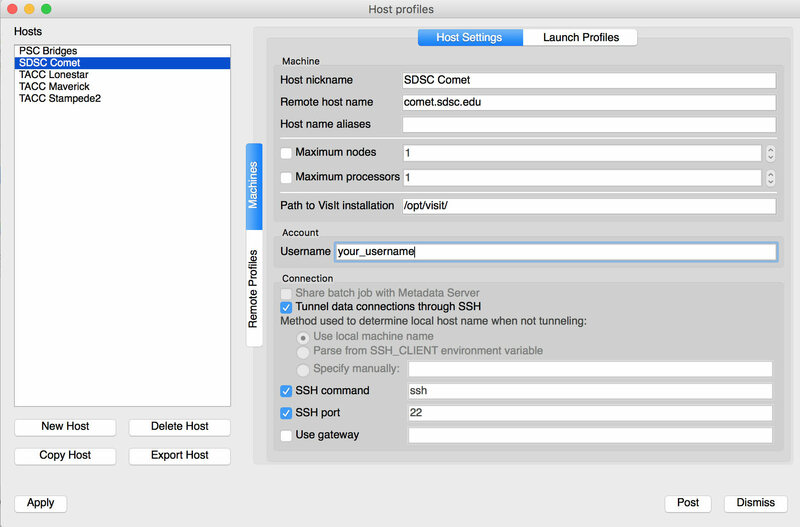 Check that the Path to Visit Installation is set correctly in your Comet Host profile. 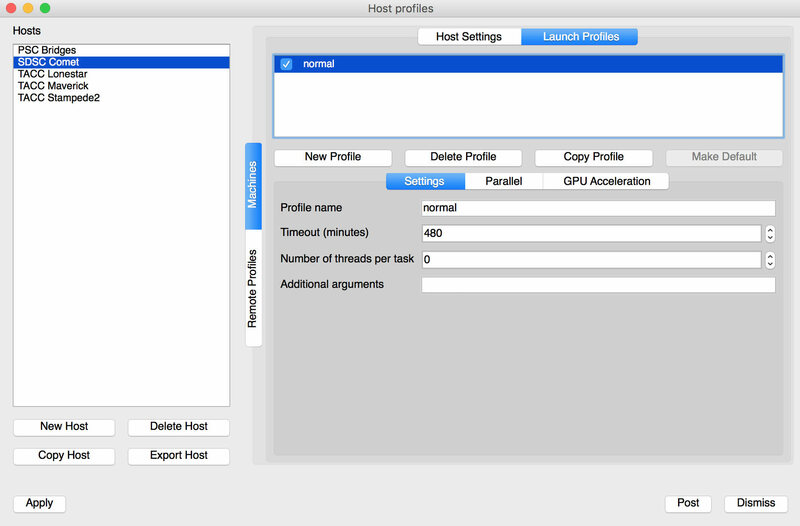 Refer to how to create a Host Profile for Comet documentation. Ensure that your computer or network firewall is not blocking the VisIt server to connect back to the VisIt client on your computer. In some cases erasing the local and remote visit settings can help resolve issues. Note: You will lose all your Host Profiles and will need to recreate them. Delete the ".visit" folder on your computer's home or "My Documents" folder. Delete the ".visit" folder on Comet in your home folder. If the Metadata Server repeatedly crashes, try enabling SSH tunneling in the host profile. For more information refer to VisIt manuals and tutorials for further guidance.